Stories from the past year of people caught up in conflict. Viju Lakshman Chavan gave birth on the day of the 2008 attacks on the Indian city of Mumbai. We hear from her five-year-old daughter Goli. Dr Akiko Mikamo's father Shinji survived the atomic bomb that was dropped on Hiroshima in 1945. She tells us how he taught her the importance of forgiveness. Murayo Torregrossa was separated from her family by war in Somalia. 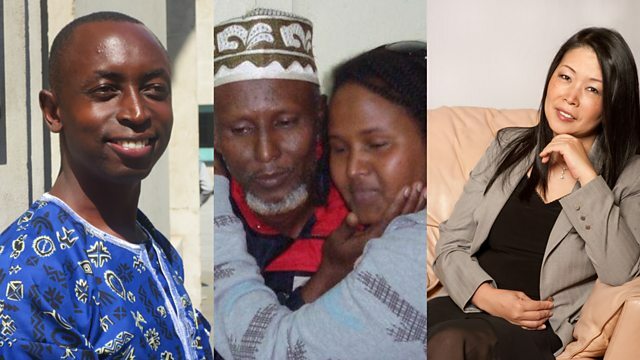 She was adopted by an Italian soldier, but her birth father Mahad Mohamed Aden never stopped looking for her. Fourteen years later he managed to trace her and they were later reunited. Health workers trying to vaccinate children against polio in northern Pakistan have repeatedly been targeted by militants. Since 2012 over 40 people have been killed because of their links to the vaccination programme. We speak to one young woman who puts her own life at risk to carry out this work. Tindy Agaba is a former child soldier from Rwanda who suffered terrible trauma in his early life. As a teenager he fled Rwanda for the UK and after a chance meeting was adopted by the Oscar-winning British actress Emma Thompson and her actor husband Greg Wise.